Help Us Celebrate the Big 5-0! 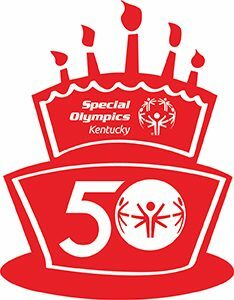 Help Special Olympics Kentucky celebrate the 50th Anniversary of Special Olympics on Saturday, Aug. 25, at the Birthday Bash! Held in the Spirit Room at the KFC Yum! Center, the Birthday Bash promises to be a fun, interactive evening to commemorate 50 years of Special Olympics changing the lives of people with intellectual disabilities and changing the communities in which they live. The Birthday Bash gets underway at 6:30 with cocktails, hors d’oeuvres, balloons and live music. At 7:30 food stations open, we’ll have interactive games and other activities, and we’ll work our way up to the Golden Ticket drawing. At 8:30, it’s time for birthday cake and boogie as we cut the cake and turn things over to Dance Party Unlimited. Tickets are sold in two tiers. A $53 ticket (including tax) gets you into all the fun and all the food and gives you one drink ticket for the bar. For $80 (including tax), your ticket gets you all of the fun, plus hosted bar service throughout the event. You can buy tickets on-line today! Can’t join us, but still want to be a part of the action? You can buy a Golden Ticket on-line. This year’s golden ticket prize is a $3,500 weekend for two in Napa, with lodging at the Westin Versa Napa Hotel, winery tour, dinner and a $750 travel gift card. Golden tickets are $100 each and ONLY 150 will be sold. You need not be present to win the Napa trip, so this is the perfect way to support the birthday fun if you can’t be a part of the event. Sponsorships are also available for corporate experiences. For more information about the Birthday Bash or about sponsorship opportunities, contact Jennifer McMahon at 502-326-5002 or jmcmhon@soky.org.